Friday, Oct. 26, 2018, 1 – 4 p.m. This event is designed for participants to attend the Thursday evening presentation and then one Friday workshop. 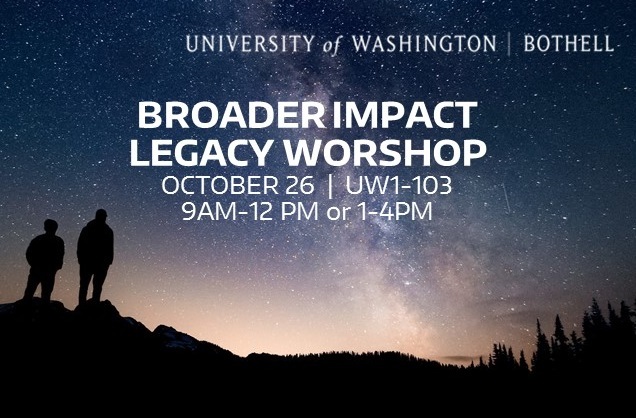 If you cannot attend both days, one session is ok.
A Broader Impact (BI) Legacy Document is a narrative created by a faculty member that details why they chose their field and how they want to change the world with their research. The document is meant to complement and enhance their research agenda. It can strengthen their promotion and tenure dossier, applications for research support, and bids for partnership with UW Bothell and external organizations. Participants will articulate their B.I. Identity by wrapping a narrative around the personal elements of: Self, Capacity, Institution, Scholarship, Society, and Discipline or Field. Events are led by Dr. Ann McMahon and Dr. Julie Risien from Oregon State University. Dr. Risien serves as an advisor to the OSU office of research development and the NSF-funded Center for Advancement of Informal Science Education. Dr. Risien is also a steering committee member on the NSF-funded National Alliance for Broader Impacts. The BI Legacy Kick-Off event is limited to 50 participants. Each identical BI Legacy Workshop session is limited to 25 participants. You may register for the Kick-Off Event and one of the two identical BI Legacy Workshops. Hosted by the Office of Research. Contact Ann McMahon with questions at mcmahon4@uw.edu.